Don't forget to enter my Z Spoke Zac Posen Handbag giveaway below! Oooh what a pretty shade! I am loving all things neon as of the moment as well. Seeing neon puts me in a bright and happy mood. 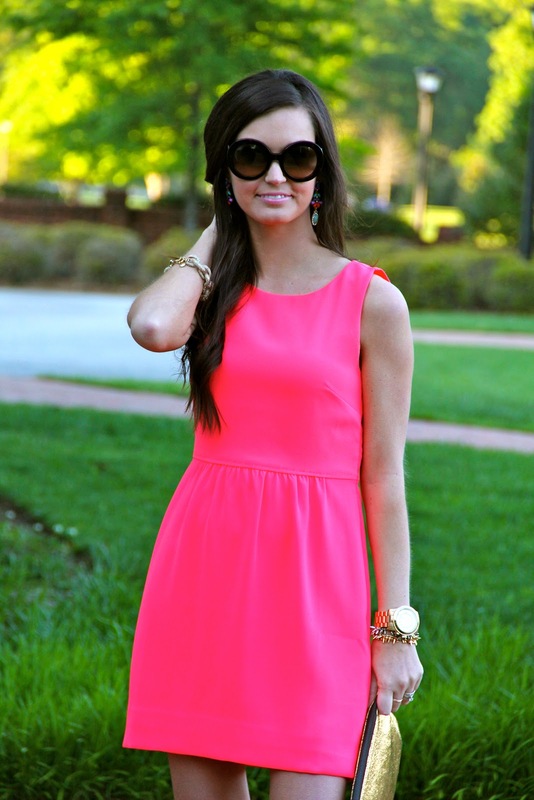 Such a great look - I'm loving this little dress on you and those neon heels are the perfect pop! Simple, but stunning! Love it! You are so damn cute!! Such a pretty dress, Megan. Who does it better than J. Crew? What really makes the whole outfit standout though is the way you carefully paired those fabulous accessories! I am adoring the glorious arm candy choices, those brilliant earring and, of course, the must-have, so coveted Prada sunnies. Beautiful look! I just love this dress on you Megan! The hues are perfect for spring/summer! Love this bright dress, it's so pretty! You look beautiful! Those earrings are to die for, loving all the neon this year that is so far from 80's neon. Love the color of that dress! Beautiful. Those bright shoes are so fun! Love that dress, it's so feminine. I saw this dress in J. Crew this weekend and I absolutely loved it!! Looks amazing on you! Such a pretty color and I love how you styled it with gold details! Gotta love those Prabal for Target shoes! You look great in all that neon. Love your Style!!! The DRess is Beautiful!! !